One of the things I love about blogging is that I get the chance to review products and share my opinion with my readers. Not all the products are equally interesting, of course, and some times I have even decided not to post a review because I had nothing good to say about the product. But once in a while I get to review something that blows me away, and as you are beginning to guess, this is one of those times! How cute are they? And do you know how pretty they looked with my grey tights and my grey skirt? I could never pull that off with bright yellow rubber boots! So check one off for fashion. But what I love the most about these boots is how comfortable they are. I mean extremely comfortable! 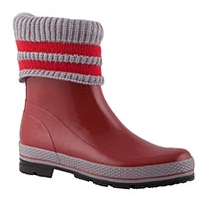 These boots are lined with polar fleece which makes all the difference in the world. I've had other rain boots which where rubber on the outside and rubber on the inside, which made slipping them on and off difficult. These boots slip on so easily and as soon as you foot is inside you feel like going "ahhh!" because the polar fleece literally hugs your foot and makes you feel warm all-over! They retail for about $75. 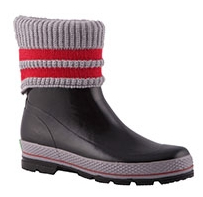 The Ringo Star boot is a snow/rain boot capable of sustaining low temperatures up to -22°F! I haven't had a chance to test them in rigorous weather yet, but I've been sporting them on and off outside and even around the house, and I can tell you that they feel extremely warm and, again, sooo comfortable. It looks like a big boot, but fortunately your ankle is free to move thanks to the nylon material (and not anything heavy or hard like some other snow boots) which makes these boots light and easy to walk with. I am surely looking forward to some snow, so that I can really test them out (but I'm pretty sure they'll do just fine). The Ringo Star retail for $180. 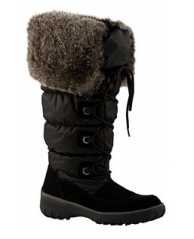 If you're in the market for new boots, don't forget to check out Cougar Boots. Disclaimer: The featured product was provided to me, at no cost, by the manufacturer or representing PR agency for the sole purpose of product testing and review. NY Spender is not being compensated monetarily for this review. Opinions expressed are my own and are not influenced by compensation, monetary or otherwise. Really cool boots, all of them. However does the material at the top become wet during the rain or stepping through the snow. I wouldn't know, the weather where I live is as dry as a desert.